March 28, 2019, Denver, CO -- Yesterday, was another big stride for living organ donors! 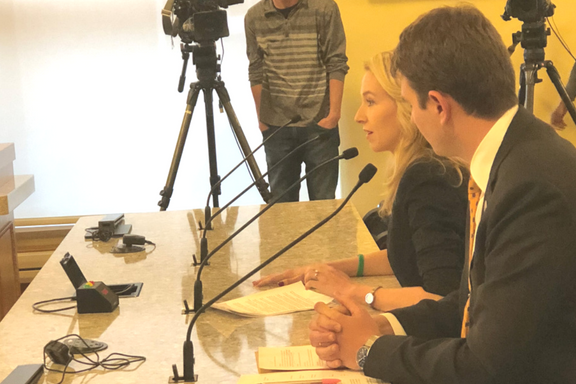 At the Health & Insurance Committee Meeting at the Colorado State Capitol, Sponsors Representative Buckner and Representative Landgraf presented House Bill 19-1253. The Living Organ Donor Insurance Act (HB19-1253) prohibits insurance companies from denying coverage or increasing premiums for living organ donors based solely on their status as a living donor. By removing such barriers, more people can give and receive lifesaving organ transplants. The Health & Insurance Committee was overwhelmed that this discrimination even exists and was intrigued by the testimony given. 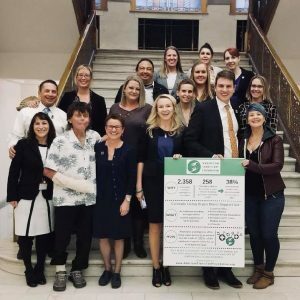 Representative Titone of the Health & Insurance Committee recently added herself to the Bone Marrow Registry and was immediately a strong 'Yes' in support of this Bill, as well as many other Representatives. The Committee heard testimony from our friends over at the National Kidney Foundation, and an organ receiver Gary who spoke on behalf of American Transplant Foundation. Because of Gary's organ donor, he was able to receive a kidney and get off of dialysis within months of his diagnosis. Most individuals waiting for a deceased kidney donor, spend 5-7 years on dialysis while waiting. It was clear that after Gary's testimony, the Committee was excited to help get this Bill passed. 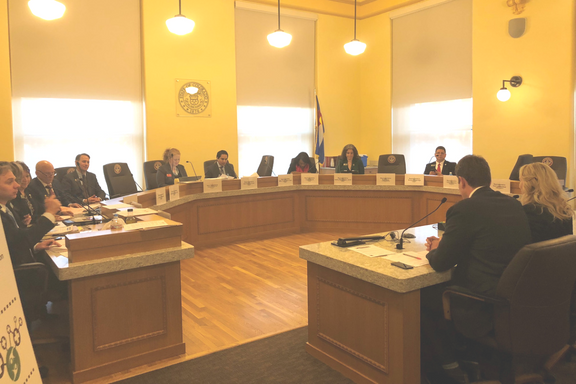 In fact, statements were given by Representatives Soper, Baisley, Beckman, Will, and Jackson, as well as Chairwoman Lontine in support of this Bill. After testimony and further discussion, House Bill 19-1253 (The Living Organ Donor Insurance Act) passed unanimously 9-0. Thank you to Representative Buckner and Representative Landgraf for sponsoring this life-changing legislation. Also, a huge 'Thank You!' to all of the living organ donors out there who are saving lives every day! We're looking forward to taking this legislation to the Senate to better your life as donors. For more information on The Living Organ Donor Insurance Act, download our fact sheet HERE. If you are in support of The Living Organ Donor Support Act, sign our petition HERE. A bipartisan group consisting of 15 members of the House of Representatives have introduced the Organ Donor Clarification Act in order to find new ways to help support potential living donors. 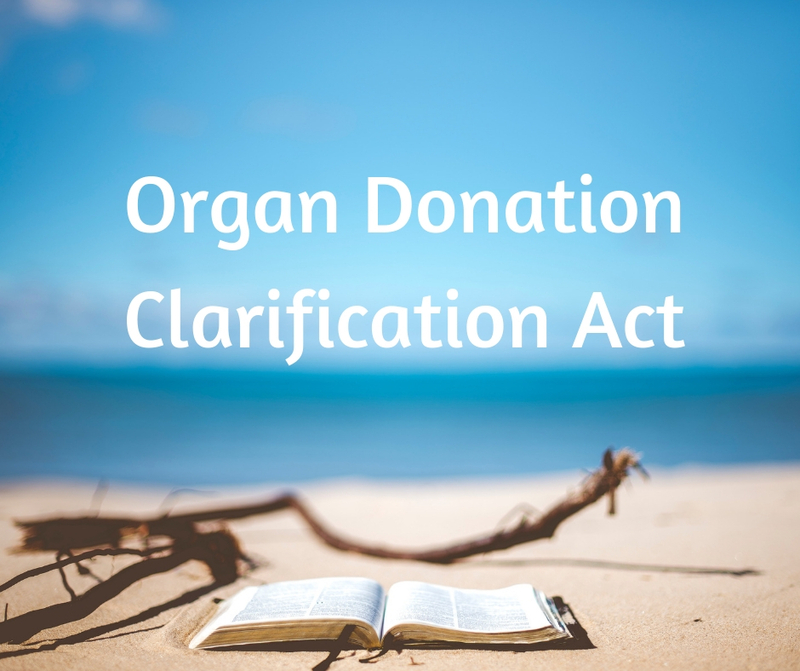 This legislation would accomplish this by clarifying the language in the National Organ Transplant Act of 1984 that prohibits buying and selling organs for “valuable consideration.” U.S. Representative Matt Cartwright (D-PA), who introduced the legislation on July 19th stated: “Confusion about what constitutes valuable consideration hampers donation by scaring people away from reimbursing organ donors for things like medical expenses and lost wages.” These reimbursements are legal, and clarifying this should prevent some of the financial confusion involved with becoming a living donor. Additionally, this bill would allow for the development of a government pilot program to test the effectiveness of non-cash incentives to living donors in an attempt to further reduce the waitlist for organs. We at the American Transplant Foundation are proud to endorse and support this bill and we encourage you to reach out to your representatives to request that they also support this bill moving forward. 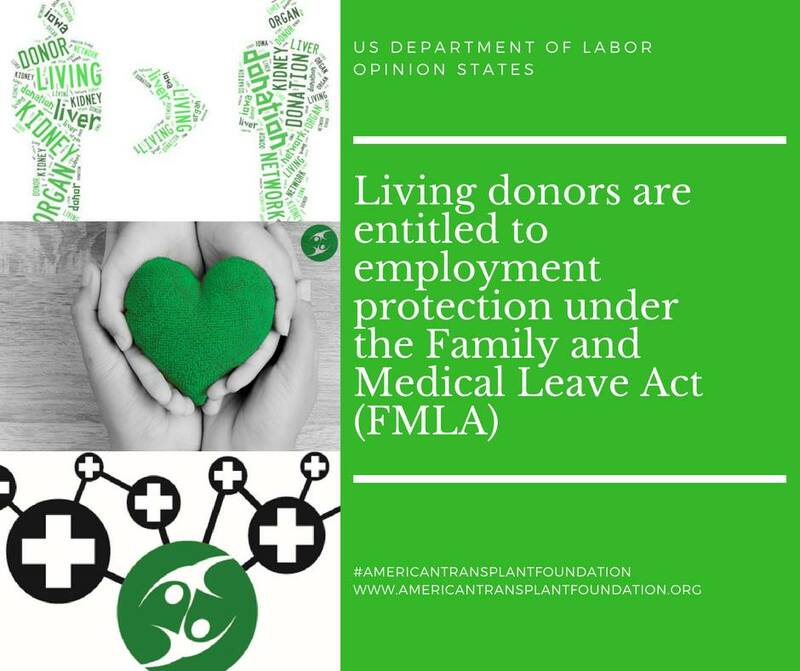 The US Department of Labor recently submitted an opinion letter regarding the question of whether or not living donors qualify for FMLA leave. They conclude: “An organ donation can qualify as an impairment or physical condition that is a serious health condition under the FMLA…” As such, living donors are entitled to protected, un-paid leave during the surgery and recovery period of an organ donation. This is another step forward in protecting living donors, and continuing to remove barriers to donation. Potential donors will no longer have to fear losing their job based upon their decision to donate. COLORADO – (May 15, 2018) – Tomorrow, at 4:30 p.m., Governor John Hickenlooper will sign the Colorado Living Donor Support Act - HB1202. 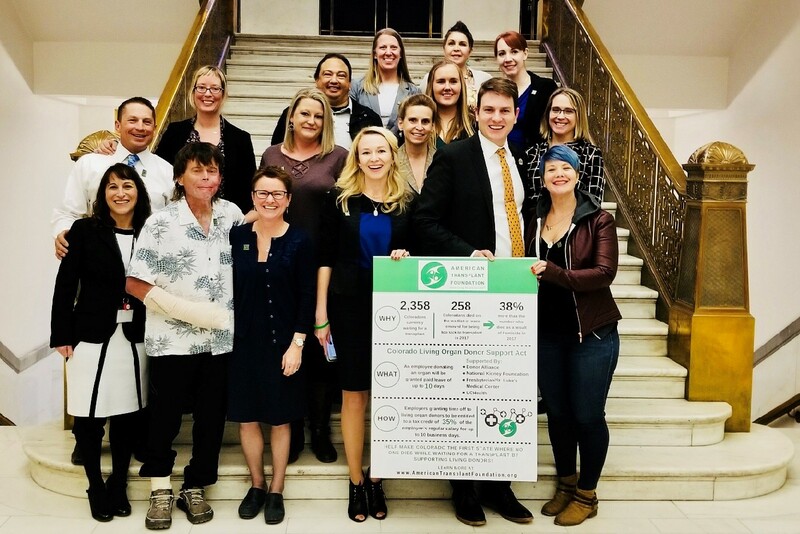 This legislation will remove a significant barrier for living kidney and liver donors who may not step forward if they are afraid to lose their job or income during their recovery period after surgery. It makes Colorado one of the first states in the country to subsidize paid leave for living organ donors by providing a tax credit for employers. There are 2,300 people on the waitlist for an organ transplant in Colorado. 96% of those individuals are in need of a liver or kidney, both of which can be donated by a living person. Studies have found that the average American experienced nearly $2,000 in lost wages when they donate a kidney, and more Coloradans die each year of kidney and liver failure than all the homicides in the state combined. Also, recent studies have shown that many transplant patients won’t talk about living donation because they are concerned that their family members and friends will lose income and experience financial hardship as a result of living organ donation. The American Transplant Foundation introduced HB-1202 in February 2018 and has lead grassroots advocacy efforts to ensure its successful passage. 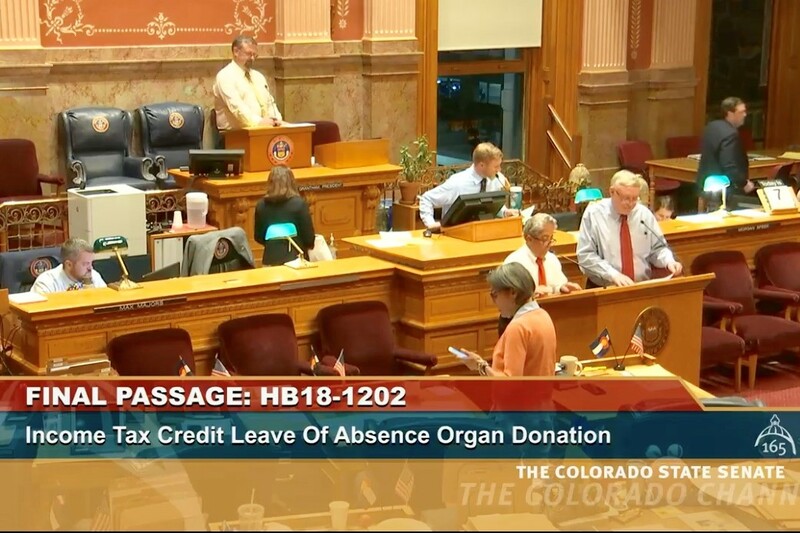 Until now, the only legislation in place to support living donors in Colorado applied only to state employees and provided them with just two days of paid leave specific to organ donation. Bill Background: The Living Donor Support Act would provide up to 10 days of paid time off to living organ donors in the State of Colorado. Employees who receive less than $80,000 annually are eligible. The Act would provide a tax credit of 35% to employers granting paid time off to employees becoming living organ donors. In addition, employers will receive a tax credit for the cost of temporary replacement help. The bill will take effect on January 1st, 2020. 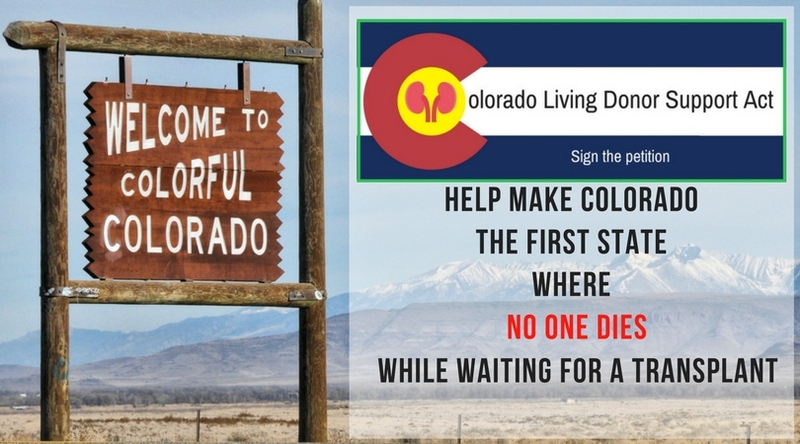 COLORADO LIVING DONOR SUPPORT ACT PASSED THE STATE SENATE! 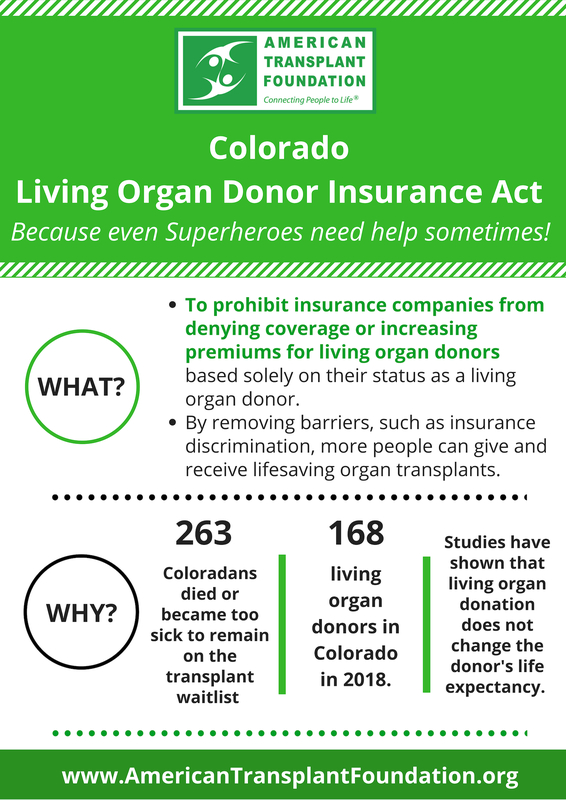 The first bill to provide specific benefits to living organ donors in the state of Colorado was passed by our small, but mighty team. This was not an easy bill to pass and there were many hurdles to cross- but thanks to our dedicated staff, Board Members, volunteers, and many supporters, we were able to achieve the seemingly impossible! 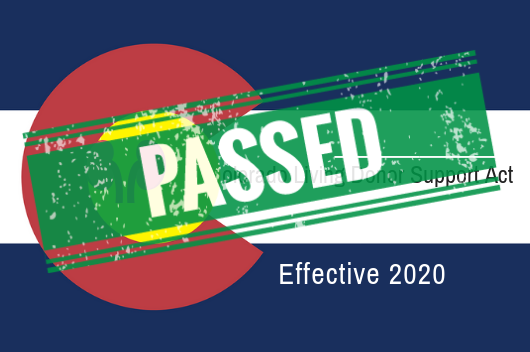 The Colorado Living Donor Support Act will take effect in 2020, providing time for our legislators to plan its implementation and work it into the state budget. Many of you personally reached out to your district Senators in support of this critical piece of legislation and your voices were heard! Please take a moment to reach out and thank those Senators who voted in favor of this bill. Thank you to everyone who supported us through this long process and to the Senators who recognize the courage and lifesaving efforts of Colorado's living donors. We could not have done it without you! Last year, more Coloradans died or became too sick to remain on the transplant wait list than the number of Coloradans who died as a result of homicide. Please visit the Colorado Organ Donation FAQs page for additional statistics on organ donation in our state. Help us support living donors by making the process less of a burden. 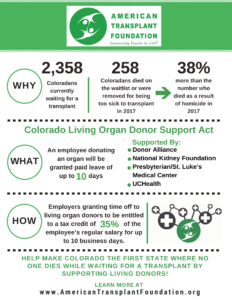 Currently, only Colorado state employees may take up to two days of paid leave per fiscal year specifically for organ donation. The ability to get paid time off work is an enormous barrier for living donors. The loss of income and fear of losing their job has deterred many kidney and liver living donors. This bill will raise awareness and encourage both directed and non-directed living donation, encouraging and helping individuals to donate lifesaving organ without suffering financial hardship as a result of the donation. An employee donating an organ will be granted paid leave not exceeding 10 working days or the hourly equivalent and for the cost of temporary replacement help, if any, during an employee's leave of absence period. For any employer granting paid time off to living organ donors in the state of Colorado, employers shall be entitled to a tax credit of 35% of the employee’s regular salary for up to 10 business days. Employees who receive less than $80,000 annually are eligible. 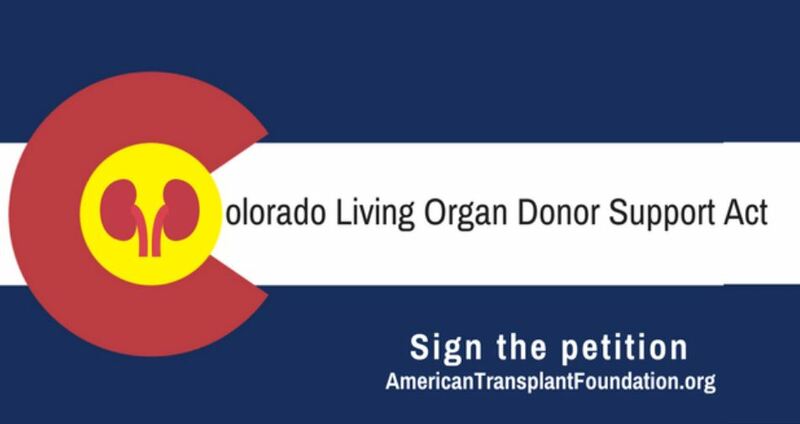 Thank you for supporting the bill and helping to make Colorado the first state where nobody dies while waiting for a transplant! Health insurance initiative: Our goal is to reform health insurance to provide better, and longer, after-care coverage for transplant recipients requiring long-term medication and medical care. Support Anti-Rejection Medication Coverage Bill: After receiving a kidney transplant, a patient must take immunosuppressive drugs for the rest of their life, at a cost of $19,000 per year. Without these drugs, the body will reject the organ and the patient will have to go on dialysis. Under current law, Medicare covers these medication costs for three years only, but will cover much higher dialysis costs – $77,000 per year – indefinitely. Click here to learn about current legislation and sign our petition to Congress. Organ and donor registration initiative: Through an ATF driven initiative, the Colorado Department of Revenue has printed an organ and tissue donor registration form in the State Income Tax booklet, providing Colorado residents an easy, and annual, opportunity to register as a donor. We are currently working with the State towards integrating an easy check-off into the form that will facilitate an even more simplified means of registering. Clarify elimination of the family veto: Our goal is to clarify the role of a deceased organ donor's family when it comes to family veto rights regarding the recovery of organs from the donor. Legalize private organ exchange: Our goal is to achieve policy that will legalize arranged organ donations between consenting parties in America. Support stem cell research: Our goal is to support and represent policy that furthers stem cell research because advancements can lead to increased organ supplies. Expand payments allowable under NOTA: Our goal is to reform policy to expand the allowable payments to support organ transplants.